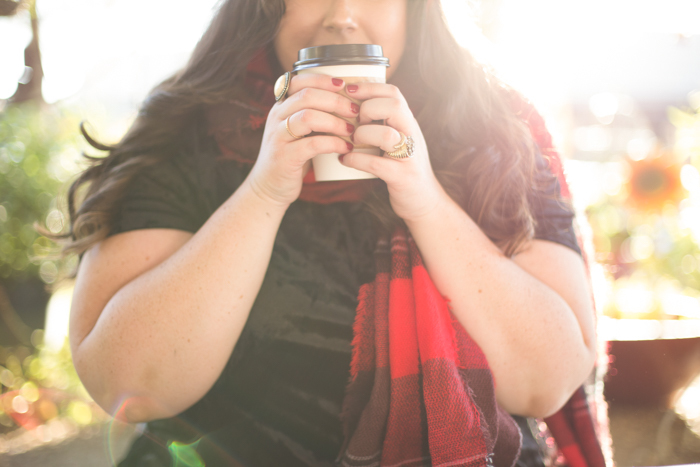 This merry, comfortable yet chic Christmas-inspired OOTD gives me alllll the Christmas feels! Sleigh bells are ringing and it's finally cool enough to wear a scarf in the valley! We have waited what feels like forever for this kind of weather to come to Phoenix! For weeks, we have all been suffering in the heat and refusing to give up our right to wear fall sweaters, boots, and scarves. After a warm start to fall and constant 80 degrees temperatures, it has finally started to truly feel like fall in the valley of the sun. Black and red plaid accessories are everywhere--handbags, jackets, sweaters, boots, and scarves. This scarf brings the festivity that comes with holiday fashion, and this black velvet t-shirt is still cool enough to wear so if the valley temperatures decide to spike up in the afternoon you won't start sweating. 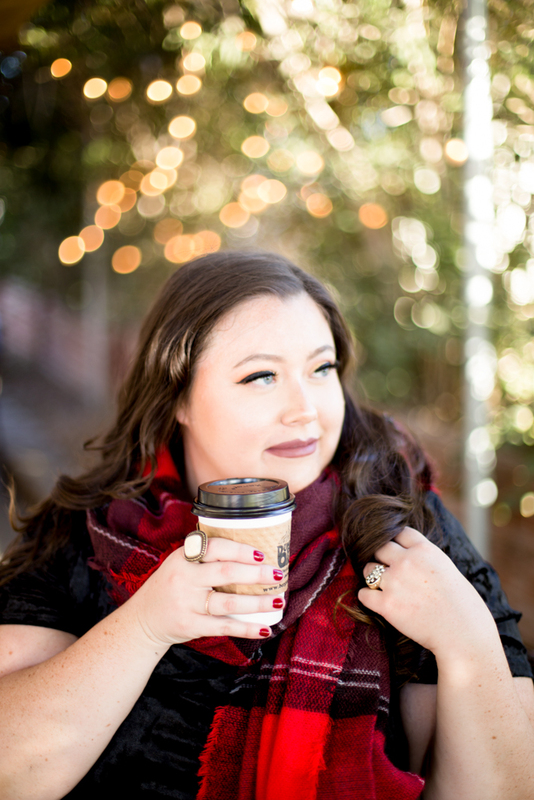 Complete the look with a few statement rings, a comfortable pair of form-fitting skinny jeans, black velvet boots, and a cup of warm cocoa! My kids were just asking me at dinner tonight how warm AZ is! When winter hits the midwest, it is COLD! Today was 30 degrees ad super windy!! You looks amazing. The red and black goes perfectly and really bring a holiday feel to your outfit. I love this! Thanks for the inspiration! I understand completely, I am dying to put on a sweater and my favorite boots, but it doesn't look like I will get that chance anytime soon unless I leave Florida for a short get away. Hope it gets even cooler for you soon! I know it's fun to switch things up and finally wear the things meant for Fall/Winter! Love the boots and scarf. Hope you have a happy holiday! ~~~I'd be happy to send you some of our 20 degree weather! Maybe we could share and go halfsies. . . like 50 degrees, each? It's so cold here in NY already! I wish it were still warm enough out not to need a coat and sweaters. I love that scarf and this whole look! I won't say I'm jealous of your weather but I kinda am! As much as I love sweaters, boots and coats I could do without the brutal low temps we're about to get in Chicago.